On July 20, 47,000 square meters of land in the port city of Pyeongtaek, Gyeonggi Province, 65 kilometers south of Seoul, began to be parceled out to companies with foreign ownership that have sought lower expenses in business administration and synergy effect. By giving priority in sales of land in its industrial complex to Korean auto part makers and machine manufacturers that had received foreign investment, authorities said Pyeongtaek BIX will serve as a hub for the Yellow Sea Free Economic Zone, a state-led investment project that kicked off in 2008. Influenced by firms with foreign ownership, Pyeongtaek BIX -- short for Business & Industry Complex, divided into industrial and logistics zones -- is also expected to become a place where “various cultures meet and mingle,” according to YESFEZ authorities. Sales of land in industrial zone will be open to firms with Korean ownership starting the fourth quarter this year. Businesses in the BIX industry complex will begin operation in March 2019, according to the YESFEZ plan. Also, land for Pyeongtaek BIX logistics zone began to go on sale to Korean small and mid-sized companies in July. YESFEZ has touted the lower price of Pyeongtaek BIX land compared to adjacent industrial complexes. While land at Pyeongtaek-Asan National Industry Complex and Poseung Industrial Complex 2 were on average trading at 757,500 won ($683.40) and 636,400 won per square meter, Pyeongtaek BIX was expected to sell at 518,200 won per square meter at maximum, according to YESFEZ authorities. 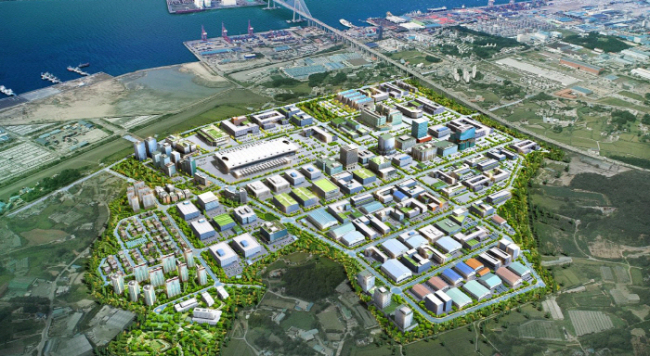 Moreover, companies buying land in industrial zone in Pyeongtaek BIX will be given various tax benefits, including a 50 percent cut in acquisition tax and a 35 percent cut in property tax for five years after purchase. Pyeongtaek aims to finish the five-year construction by 2020 with a budget of 800.4 billion won from state-led builders Gyeonggi Urban Innovation Corporation and Pyeongtaek City Corporation. As of July, the construction stood at 67 percent complete, covering as much as 2 million square meters of land.